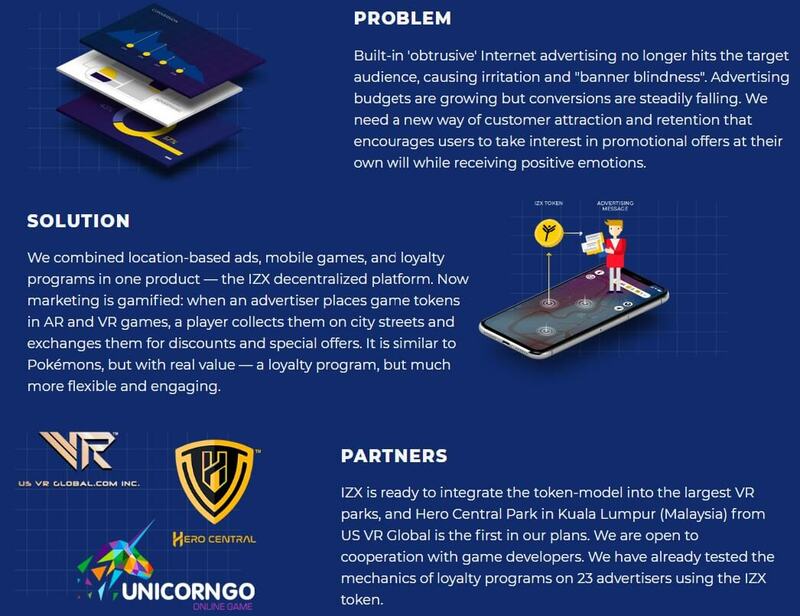 IZX is a decentralized platform for building effective interaction between advertisers, game developers and customers. It allows business to utilize augmented and virtual reality games in order to convert game players to real customers. Business logic of marketing campaigns built on IZX platform is flexy customizable and managed by smart contracts. Game artifacts are tied to IZX Drive tokens which backed by special offers and discounts. The game player finds artifacts inside a game arena and receives tokens to her wallet. Then she can exchange the tokens on discounts in a place that sells product or provide services, e.g. hotel, restaurant, clothes store or barbershop. IZX intent is to make business-to-customer value exchange transparent, secure and easy perceived by customer, at the same time affordable for local business. It brings new opportunities for businesses to build their own effective marketing campaigns, provides new monetization options for mobile game developers and finally makes end-users happy by erasing the boundaries between virtual and real treasures. 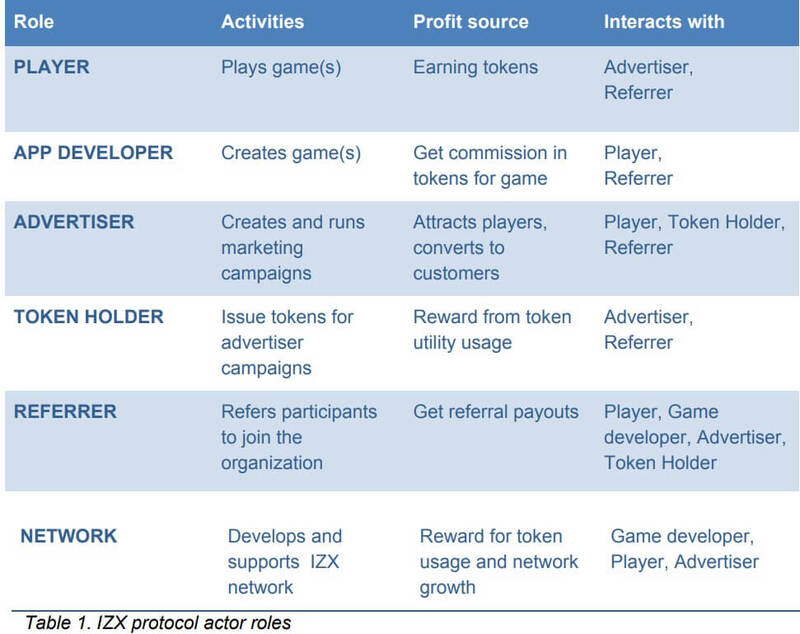 IZX is a decentralized monetization platform for independent game developers with elements of augmented or virtual reality. The advertising provider may choose games that will be used for its promotional events, their developers get royalties. IZX is a blockchain-based network, its code is open source, and it has no geographical boundaries. Building without-middlemen economical interaction between advertisers, developers and customers. Rewarding game and applications developers who help businesses to interact with customers. Implementing discounts, special and personal offers for customers. Transferring players efforts and passion into brand awareness and loyalty. Advertiser’s value proposition to customers. Value which particular customers may bring to business. 1) Availability to everyone – with no need in additional costs or knowledge. 2) Usefulness in applied value in everyday life. IZX mission is to make value exchanges between business and clients clear, easy and straightforward. We wish to let people independently decide which value proposals and how they’d like to receive in their information flow. 1) Online marketing has a lot of middlemen. It leads to high costs and inefficiency. 2) In digital advertising models, offline business loses comparing to online businesses in most cases. 3) Traditional online marketing models as CPM, CPC and even CPA do not exactly match offline business objectives: they pay for virtual actions, not for real ones. 4) Temporary and focused goals, which businesses frequently represent as special offers with limited proposition, are hardly covered with existing models. IZX protocol sophisticatedly solves these problems by applying cutting edge technologies to build new effective ecosystem. By more than 2.5 billions of smartphone owners on Earth cryptocurrency will soon be perceived as a mundane reality – always at hand, easy to use, reliable, fast and safe way to exchange values. However today most of this immerse audience remains untapped by the crypto-economy because of the high threshold of the technology perception. It is not easy for ordinary people to understand the blockchain concepts deep enough to recognize the fantastic opportunities it can bring to our life. We target this issue by providing the product, which makes the use of cryptocurrency as clear and simple as just catching the Pokemon in the popular mobile game. Users can earn crypto-tokens by simply gathering virtual coins with their smartphones. IZX turns the game app into a crypto-wallet, facilitating the cryptocurrency perception by people. Meanwhile, crypto-tokens gathering is just a half of the deal. Earning cryptocurrency as a reward engages players into the game rather effectively (more details in the Proof-Of-Concept paragraph of this paper). 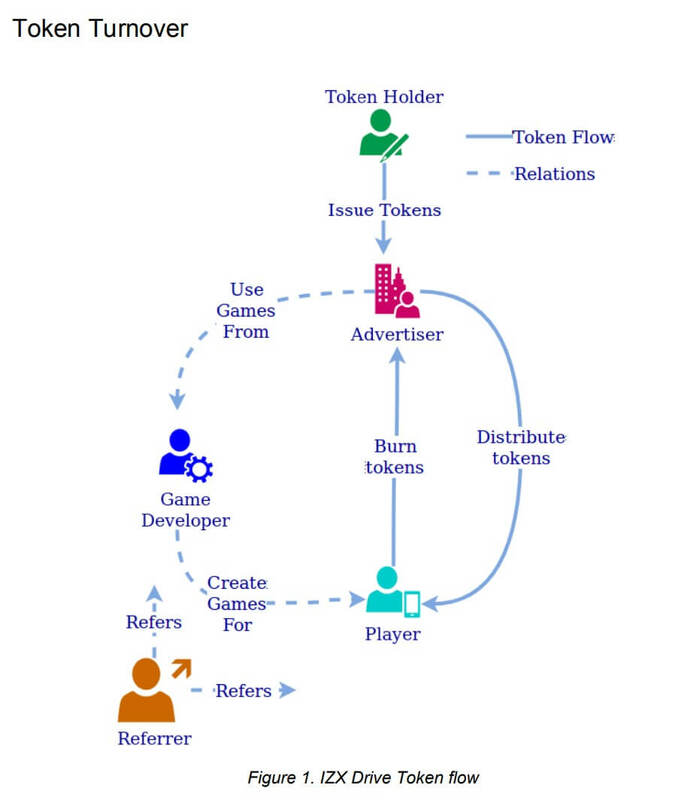 But what if those tokens were intentionally placed into the game by a company to promote its product or service? These tokens just serve transport function for the values proposed by advertisers to their potential customers. Players put a certain effort to earn these virtual tokens, therefore they have clear incentive to come to the company which claims to exchange the tokens for the real discount or special offer. That’s how IZX provides advertisers with the way to attract attention and motivate to real actions the generation, which basically spends five hours of their day in a smartphone. The economic model is based on micro-payments. IZX gives businesses mechanics for client acquisition, user retention and loyalty programs with the micro-payment infrastructure. Overall, IZX protocol can be applied in most scenarios, where B2C customers interact in business, be it with or without monetary value. IZX added value comes from the additional interactions between customers and businesses that will not take place otherwise. 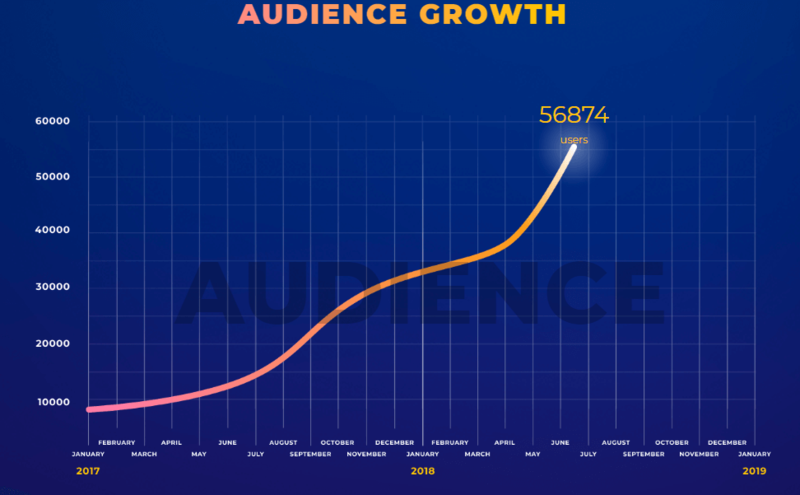 Businesses, being in a role of Advertiser to the IZX protocol, are willing to run marketing campaigns to engage new or retain existing clients. Advertisers buy IZX Drive Tokens to run advertising campaigns. Players play the game to collect tokens. After collecting, they are motivated to go to an advertiser to monetize their tokens in exchange to special offer, prize, money or any other reward. Application developers create new games, integrate tokens into existing games, attracting new and existing players to use IZX Drive tokens. This gives application developers an additional monetization channel for their games. Application developers, who are attracting new potential customers to advertisers, generate the added value. Primary cash flow comes from advertisers, who pay for tokens. IZX is the community-managed organization, built on DAO (decentralized autonomous organization) principles. There is no central point of control or decision point. Every IZX participant has equal rights to contribute to the organization. The power in making decisions and ability to benefit from activities is always proportional to his or her contribution to the organization development. The contribution can be done in a variety of ways, enabling many roles to interact with own benefits. Technology and business model are aimed at the wide adoption of the blockchain technology in the society. This assumes the priority given to scale-out as opposed to scale-up approaches to technology and business decisions. IZX tokens model is open to extensions and changes in accordance with participant interests. Roles are defined for better understanding of the business model, related mechanics and processes. Participants may play multiple roles simultaneously, or in different times, according to their preferences and goals. The list of roles is not limited, as IZX organization may change or extend them. We use role terms to denote a particular protocol usage pattern. However, a particular person may execute multiple roles, depending on real life situation.